Staples Center measures 950,000 square feet (88,257.9 m2) of total space, with a 94-foot (28.7 m) by 200-foot (61.0 m) arena floor. It stands 150 feet (45.7 m) tall. The arena seats up to 19,067 for basketball, 18,340 for ice hockey, and around 20,000 for concerts or other sporting events. Two-thirds of the arena's seating, including 2,500 club seats, are in the lower bowl. There are also 160 luxury suites, including 15 event suites, on three levels between the lower and upper bowls. The arena's attendance record is held by the fight between World WBA Welterweight Champion, Antonio Margarito and Shane Mosley with a crowd of 20,820 set on January 25, 2009. Outside the arena at the Star Plaza are statues of Wayne Gretzky and Magic Johnson, although both played at The Forum, where the Kings, Lakers and Sparks previously played. A third statue of boxer Oscar De La Hoya was unveiled outside Staples Center on December 1, 2008. On April 20, 2010 a fourth statue of the late long time Lakers broadcaster Chick Hearn, behind a Laker desk with a chair for fans to sit down for a picture, was unveiled. A fifth statue of the Laker legend Jerry West dribbling was unveiled on February 17, 2011. A sixth statue of Lakers player Kareem Abdul-Jabbar was unveiled on November 16, 2012. A seventh statue of former Kings' Hall of Fame left wing Luc Robitaille was unveiled on March 7, 2015. An eighth statue of Lakers center Shaquille O'Neal was unveiled on March 24, 2017. On January 13, 2018 a ninth statue, of legendary Kings announcer Bob Miller, was unveiled. A tenth statue of Laker legend Elgin Baylor was unveiled on April 6, 2018. On January 15, 2018, in the aftermath of an NBA basketball game between the Houston Rockets and the Los Angeles Clippers, point guard Chris Paul made the best of playing in Staples Center for 6 years by utilizing a secret tunnel (connecting the away team's locker room to the backdoor of the Clipper's locker room) to confront former Clipper teammates Austin Rivers and Blake Griffin.The final score of the game was 102-113. He was joined with teammates such as Trevor Ariza, James Harden, and Gerald Green to confront the opponents, which only resulted in verbal altercations. Long before construction of the Staples Center broke ground, plans for the arena were negotiated between elected city officials, and real estate developers Ed Roski of Majestic Realty and Philip Anschutz. They had acquired the hockey team the Los Angeles Kings in 1995 and were in the beginning of 1996 looking for a new home for their team, which then played at the Forum in Inglewood. Majestic Realty Co. in conjunction with AEG were scouring the Los Angeles area for available land to develop an arena when they were approached by Steve Soboroff, then president of LA Recreation and Parks Commission. Mr. Soboroff requested that they consider building the arena in downtown Los Angeles adjacent to the convention center. The proposal intrigued Roski and Anschutz and soon a plan to develop the arena, the current Staples Center, was devised. Months of negotiations ensued between Philip Anschutz and city officials with Ed Roski and John Semcken of Majestic Realty Co. spearheading the negotiations for the real estate developers. The negotiations grew contentious at times and the real estate developers threatened to pull out altogether on more than one occasion. The main opposition came from Councilman Joel Wachs, opposed utilizing public funds to subsidizing the proposed project and councilwoman Rita Walters, who objected parts of it. Ultimately, the developers and city leaders reached an agreement and in 1997, construction broke ground and Staples Center opened a year later. It was financed privately at a cost of US$375 million and is named for the office-supply company Staples, Inc., which was one of the center's corporate sponsors that paid for naming rights. The arena opened on October 17, 1999, with a Bruce Springsteen & The E Street Band concert as its inaugural event. On October 21, 2009, Staples Center celebrated its 10th anniversary. To commemorate the occasion, the venue's official web site nominated 25 of the arena's greatest moments from its first ten years with fans voting on the top ten. During the late summer of 2010, modifications were made to the arena, including refurbished locker rooms for the Clippers, Kings, and Lakers and the installation of a new high-definition center-hung video scoreboard, replacing the original one that had been in place since the building opened in 1998. The Panasonic Live 4HD scoreboard was officially unveiled on September 22, as AEG and Staples Center executives, as well as player representatives from the Clippers (Craig Smith), Kings (Matt Greene), and Lakers (Sasha Vujacic) were on hand for the presentation. After his death in 2009, Michael Jackson's memorial service was held at Staples Center. Musician Nipsey Hussle's memorial service was also held at Staples Center, on April 11th, 2019. Staples Center also hosted the 1st Annual Latin Grammy Awards in 2000 and the 2012 MTV Video Music Awards. The annual Grammy Awards ceremony have been held at Staples Center since 2000, with the exception of 2003 and 2018. As of 2019, the venue has hosted the Grammy Awards eighteen times, hosting more than any other venue. The venue opened in 1999 as the home of the Los Angeles Lakers and Los Angeles Clippers (NBA), and Los Angeles Kings of the NHL. The Los Angeles Sparks of the WNBA joined in 2001, while the Los Angeles D-Fenders of the NBA D-League joined in 2006. It became home to the Los Angeles Avengers of the Arena Football League in 2000 until the team's discontinuation in 2009. Since its opening day, the Staples Center has hosted seven NBA Finals series with the Lakers, the 2012 and 2014 Stanley Cup Finals, three WNBA Finals, the 2002 U.S. Figure Skating Championships, the 52nd and 62nd NHL All-Star game, three NBA All-Star Games (2004, 2011 and 2018), the Pacific-10 Conference Men's Basketball Tournament (from 2002–12), the WTA Tour Championships (from 2002–05), UFC 60 in 2006, UFC 104 in 2009, UFC 184 in 2015, UFC 227 in 2018, the 2009 World Figure Skating Championships, the Summer X Games indoor competitions (from 2003–13), and several HBO Championship Boxing matches. On January 22, 2006, Los Angeles Lakers player Kobe Bryant scored a career-high 81 points in the Staples Center against the Toronto Raptors, the second-highest number of points scored in a single game in NBA history, second only to Wilt Chamberlain's 100-point performance. Of the team's five NBA championships since moving to the venue, the Lakers have celebrated their 2000 and 2010 victories at Staples Center with series-winning victories at home. Prior to the 2006–07 NBA season, the lighting inside Staples Center was modified for Lakers games. The lights were focused only on the court itself (hence the promotional Lights Out campaign), reminiscent of the Lakers' early years at The Forum. Initial fan reaction was positive, and has been a fixture on home games since. The Daktronics see-through shot-clock was first installed prior to the 2008–09 NBA season. The Clippers adopted the new see through shot clock prior to the 2010–11 NBA season. For Sparks games, the court used is named after Sparks player Lisa Leslie, and was officially named prior to the 2009 home opener against the Shock on June 6, 2009. The Los Angeles Kings, of the NHL hosted the 2010 NHL Entry Draft at the arena in June 2010. The Stanley Cup Finals were held at the arena for the first time in 2012. The Kings hosted the New Jersey Devils in games 3, 4, and ultimately defeated the Devils in game 6 by a final score of 6-1. The Kings became the first team to win the Stanley Cup on home ice since 2007. During the spring of 2012, NHL's Kings, along with NBA's Lakers and Clippers reached the post-season, making it the first time the arena would host three playoff teams. The Lakers unveiled a new hardwood court before their preseason game on October 13, 2012. Taking a cue from soccer clubs, the primary center court logo was adorned with 16 stars, representing the 16 championships the Lakers franchise has won. 2000: On June 19, 2000, the Lakers defeated the Indiana Pacers 116-111 in game 6, which took place at home, to win their twelfth championship title. This was also notable for being their first championship since 1988. 2010: On June 17, 2010, the Lakers defeated the Boston Celtics 83-79 in game 7, which took place at home, to win their sixteenth championship title. 2012: On June 11, 2012, the Kings captured their first Stanley Cup in franchise history after defeating the New Jersey Devils 6-1 at home in game 6. 2014: On June 13, 2014, the Kings captured their second Stanley Cup in franchise history after defeating the New York Rangers 3-2 at home in double overtime of game 5 on a goal scored by Alec Martinez. It was their second championship in the last 3 years. The January 24, 2000 Episode of WCW Monday Nitro was held in the Staples Center. In 2013 and 2016, Staples Center hosted the grand finals of the Worlds Championship of the video game League of Legends. On February 22-23, 2019, the Professional Bull Riders will bring their annual "Iron Cowboy" bull riding elite series Unleash the Beast event to Staples Center in what will be the PBR's first-ever visit to the venue. The 2000 Democratic National Convention was held at Staples Center. Staples Center was named Best w Major Concert Venue for 1998 and Arena of the Year for 1999, 2000 and 2001 by Pollstar Magazine and has been nominated each year since 2000. In February 2013, PETA named Staples Center the most "vegetarian-friendly" arena in the NBA. Staples Center is only a part of a 4,000,000-square-foot (371,612.2 m2) development by Anschutz Entertainment Group (AEG) adjoining Staples Center and the Los Angeles Convention Center. The development, known as L.A. Live, broke ground on September 15, 2005. L.A. Live is designed to offer entertainment, retail and residential programming in the downtown Los Angeles area. Joel Wachs, Los Angeles City Council member who forged a deal to bring the sports arena to L.A. 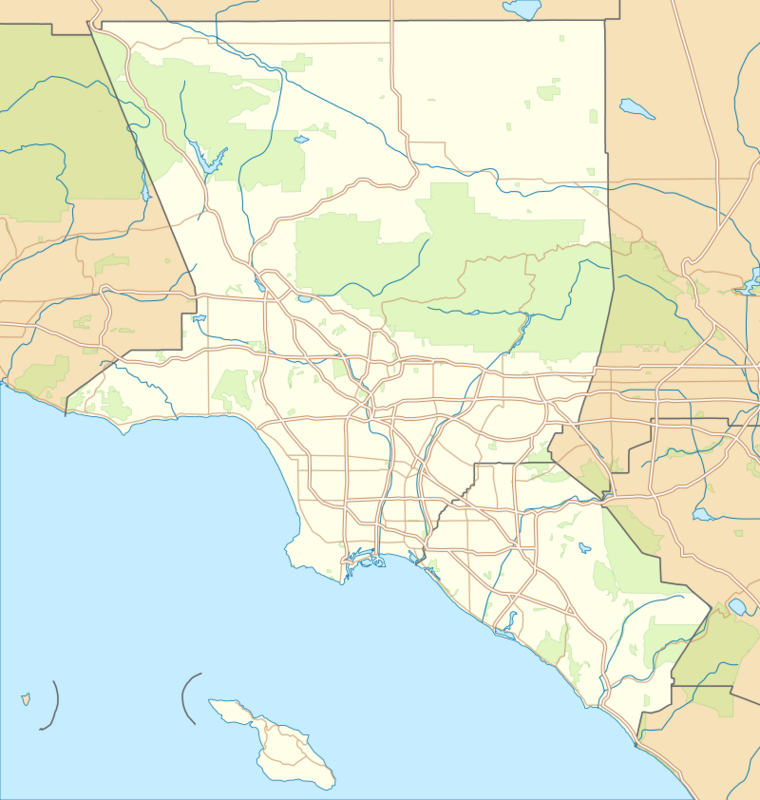 List of music venues in Los Angeles, a list of other music venues in Los Angeles. ^ a b "Guest Services: Seating Capacity". Staples Center. Retrieved March 24, 2014. ^ Kalinowski, Mike; Fischerman, Eddie; Moeller, Jeff; Altieri, MIchael; Nickson, Nick (2014). LA Kings 2014-15 Media Guide. Los Angeles Kings. p. 327. ^ a b c d "L.A. Facilities: Staples Center". Los Angeles Sports Council. Retrieved January 1, 2008. ^ a b c d "AEG Staples Center" (Press release). AEG Worldwide. Archived from the original on August 28, 2008. Retrieved January 1, 2008. ^ Dwyre, Bill (January 25, 2009). "Shane Mosley Shows He's Not Finished". Los Angeles Times. Retrieved January 25, 2009. ^ Plaschke, Bill (December 2, 2008). "Oscar De La Hoya Gets A Statue Of Limitations". Los Angeles Times. Retrieved December 2, 2008. ^ Zupke, Curtis (March 7, 2015). "Robitaille Honored To Have Statue Unveiled". National Hockey League. Retrieved March 8, 2015. ^ "Lakers to honor Shaq with statue outside Staples". ESPN.com. Retrieved 2017-12-10. ^ "Lakers Unveil Elgin Baylor Statue Outside of STAPLES Center | Los Angeles Lakers". Los Angeles Lakers. Retrieved 2018-04-07. ^ "History of AEG: The deal that almost wasn't". Daily News. 2012-09-22. Retrieved 2017-11-16. ^ a b Mandell, Jason. "The Staples Center Score". Los Angeles Downtown News - The Voice of Downtown Los Angeles. Retrieved 2017-11-16. ^ a b c WHARTON, DAVID; NORWOOD, ROBYN (1999-10-10). "Six Who Made It Happen". Los Angeles Times. ISSN 0458-3035. Retrieved 2017-11-16. ^ MERL, JEAN. "Council Expected to Be Given Plan for Arena Ticket Levy". Los Angeles Times. ISSN 0458-3035. Retrieved 2017-11-16. ^ "Staples becomes a beacon for urban renewal". www.sportsbusinessdaily.com. Retrieved 2017-11-16. ^ ROHRLICH, TED (1997-08-28). "Arena Developers Adopt a Strategy of Disclosure". Los Angeles Times. ISSN 0458-3035. Retrieved 2017-11-16. ^ MERL, JEAN (1997-01-16). "Council Endorses Deal to Build Sports Arena". Los Angeles Times. ISSN 0458-3035. Retrieved 2017-11-16. ^ Howard, Andrew (October 21, 2009). "Happy Birthday STAPLES Center". Los Angeles Kings. Retrieved October 26, 2009. ^ "Staples Center Announces the Top 25 Greatest Moments as Nominated by the Fans". staplescenter.com. February 3, 2010. Archived from the original on June 17, 2013. Retrieved February 3, 2010. ^ "Staples Center Announces the 10 Greatest Moments". staplescenter.com. April 15, 2010. Archived from the original on December 13, 2012. Retrieved April 15, 2010. ^ "Staples Center unveils Live 4HD scoreboard system by Panasonic". staplescenter.com. September 22, 2010. Archived from the original on November 28, 2010. Retrieved October 18, 2010. ^ TVGuideNews (July 7, 2009). "Top Moments: Michael Jackson Memorial". TVGuide.com. Retrieved June 22, 2018. ^ "About Staples Center" (Press release). AEG Worldwide. Retrieved January 1, 2008. ^ "Staples Center: 10 years of boxing and counting". ringtv.com. Retrieved January 28, 2018. ^ NBA Staff (January 22, 2006). Watch All of Kobe's 81 Points in 3 Minutes. NBA. ^ "Leading Off: Lakers 'Lights Out' Puts the Light back on the Court". www.sportsshooter.com. Retrieved 2017-06-27. ^ Woike, Dan (2012-04-23). "Three playoff teams a 'windfall' for busy Staples Center". The Orange County Register. Retrieved 2013-08-11. ^ Matsuda, Gann (2012-06-12). "Los Angeles Kings Win 2012 Stanley Cup, Turning Dreams Into Reality, The Unthinkable Into Fact". Retrieved 2013-08-11. ^ "STAPLES Center Named Top Veggie-Friendly NBA Arena". CBS Los Angeles. 2013-02-13. Retrieved 2013-08-11. ^ "AEG L.A. Live" (Press release). AEG Worldwide. Archived from the original on December 22, 2007. Retrieved January 1, 2008. ^ "L.A. Live timeline" (Press release). AEG Worldwide. Archived from the original on July 23, 2008. Retrieved January 1, 2008. The 1999–2000 NBA season was the Lakers' 52nd season in the National Basketball Association, and 40th season in Los Angeles. It was also the Lakers first season playing in their new arena, the Staples Center. During the offseason, the team re-acquired former Lakers forward A. C. Green from the Dallas Mavericks, and signed free agent John Salley. Green won championships with the team in the 1980s. More significantly, the Lakers hired former Chicago Bulls coach Phil Jackson, who would go on to help the team win 5 NBA Championships over the course of the next 12 years. The Lakers posted long winning streaks throughout the entire season finishing the regular season with 67 wins, the most wins since the 1971–72 team won a franchise-record 69 games. The Lakers clinched the top seed in the playoffs for the 25th time in franchise history and the first in nine years. Center Shaquille O'Neal was almost unanimously named the Most Valuable Player of the regular season.The Lakers were then pushed to the limit by the Sacramento Kings whom they defeated in a deciding fifth game, before going on to defeat the Phoenix Suns in five games in the semifinals. In the Western Conference Finals, they defeated a Portland Trail Blazers team featuring Rasheed Wallace, Scottie Pippen and Steve Smith in seven games before going on to win the NBA Finals 4–2 against the Indiana Pacers, earning the franchise its 12th NBA championship. It was the Lakers' first championship since 1988. The season is memorable, 21-year-old Kobe Bryant being named to the All-NBA Defensive First Team while emerging as one of the NBA's young superstars, Glen Rice finishing first on the Lakers with 84 three-pointers, the Lakers signing Ron Harper and Brian Shaw to give the team a veteran presence, and hiring Phil Jackson to give the team a championship experience. Bryant, O'Neal and coach Jackson represented the Western Conference in the 2000 NBA All-Star Game. Following the season, Rice was traded to the New York Knicks, Green signed as a free agent with the Miami Heat, and Salley retired after making a comeback. For the season, the Lakers sported new uniforms which remained in use until 2018. The 2001–02 NBA season was the Lakers' 54th season in the National Basketball Association, and 42nd in the city of Los Angeles. The Lakers entered the season as the two-time defending NBA champions, having defeated the Philadelphia 76ers in five games in the 2001 NBA Finals, winning their thirteenth NBA championship. During the offseason, the Lakers signed All-Star guard Mitch Richmond and free agent Samaki Walker, while acquiring Lindsey Hunter from the Milwaukee Bucks. The team got off to a fast start winning 16 of their first 17 games, and finished second in the Pacific Division with a 58–24 record. Kobe Bryant and Shaquille O'Neal were both selected for the 2002 NBA All-Star Game in which Bryant won MVP honors despite being booed by the hometown crowd, but O'Neal did not participate in the All-Star game due to an injury. After sweeping the Portland Trail Blazers 3–0 in the first round of the playoffs, then defeating the San Antonio Spurs 4–1 in the semifinals, the Lakers were pushed to the brink once more in the Western Conference Finals by their archrivals the Sacramento Kings, who they narrowly defeated in a deciding seventh game. They then went on to win the NBA Finals, defeating and sweeping the New Jersey Nets in four straight games for their second three-peat in franchise history, the first since 1952–54. Following the season, Richmond retired and Hunter was traded to the Toronto Raptors. This would be the third and final consecutive NBA Championship the Lakers won in the early 2000s, as in the next season, their quest for a fourth consecutive NBA Championship ended with a playoff elimination by the San Antonio Spurs in six games in the Semifinals, who would then go on to win the NBA Finals that season and their second NBA Championship, defeating the New Jersey Nets in six games. Although the Lakers would return to the Finals the following year in 2004, they would go on to lose to the Detroit Pistons in five games, despite being the heavy favorites to win and having former All-Stars and veterans Gary Payton and Karl Malone, leading to O'Neal's departure from the Lakers amidst boiling points between the Lakers staff and management and Kobe Bryant, culminating in his trade to the Miami Heat, marking the end of the early 2000s Lakers dynasty. The Lakers would not win another title until 2009, in which they defeated the Orlando Magic in five games. They even won another title in 2010, where they defeated the Boston Celtics in seven games. As of 2019, the Lakers are the most recent team to have accomplished a three-peat. The 2008–09 Los Angeles Clippers season was the 39th season of the franchise in the National Basketball Association (NBA). This season marks the team's 25th season in the city of Los Angeles. The 2014–15 Los Angeles Lakers season was the franchise's 67th season, its 66th season in the National Basketball Association (NBA), and its 55th in Los Angeles. Coming off from one of the worst seasons in franchise history and missing the playoffs, the team looked to rebound. Mike D'Antoni resigned in late April following two miserable seasons, leaving the team without a head coach. In the offseason, Pau Gasol left for Chicago and Jodie Meeks left for Detroit respectively, leaving big holes to fill. After failing to land the biggest names in the offseason like Carmelo Anthony and LeBron James, the Lakers brought back numerous key role players from last season including Nick Young, Jordan Hill, and Ryan Kelly. The Lakers later acquired point guard Jeremy Lin in a trade with Houston and won the bidding rights to power forward Carlos Boozer after being amnestied by Chicago in the offseason. The Lakers also drafted Kentucky's star power forward Julius Randle and shooting guard Jordan Clarkson in the 2014 NBA Draft. The team then hired Lakers Showtime player and former Coach of the Year, Byron Scott as head coach in late July. On December 14, 2014, Kobe Bryant scored 26 points to pass Michael Jordan for third on the NBA's all-time scoring list in a 100–94 win over Minnesota. The Lakers started the season a franchise-worst 1–9. Rookie Julius Randle was injured opening night and missed the remainder of the season. On March 21, 2015, Steve Nash announced his retirement. The Lakers finished with a 21–61 record, placing them last in the Pacific division for the second straight season and fourteenth in the Western conference. This was the first 60 loss season in franchise history. The 2015–16 Los Angeles Lakers season was the franchise's 68th season, its 67th season in the National Basketball Association (NBA), and its 56th in Los Angeles. The Lakers looked to rebound following its worst season in franchise history in 2014–15, but would finish with a new franchise-worst 17–65 record, which included a season-high, 10-game losing streak in January. Jordan Hill, Jeremy Lin, Wesley Johnson, Wayne Ellington, Carlos Boozer, Ronnie Price and Ed Davis all departed respectively. The Lakers drafted D'Angelo Russell, Larry Nance, Jr., and Anthony Brown in the 2015 NBA Draft. Afterwards, the Lakers traded for former Pacers' center Roy Hibbert and signed for the reigning Sixth Man of the Year, Lou Williams, and forward Brandon Bass. Former Lakers forward, Metta World Peace, was brought back to the team as well after the Lakers amnestied him in 2013. This was Kobe Bryant's final season with the team and in the NBA after he announced his retirement. Following the season, Byron Scott was fired as head coach and replaced by Luke Walton. The 2016–17 Los Angeles Lakers season was the franchise's 69th season, its 68th season in the National Basketball Association (NBA), and its 57th in Los Angeles. It was also the first season without Kobe Bryant since the 1995–96 season as he retired from the NBA in April 2016. It would also be the season where after multiple opportunities to improve upon themselves came and went, the Lakers decided to replace Jim Buss and Mitch Kupchak with former Lakers legend Magic Johnson and former sports agent Rob Pelinka on February 21, 2017 as both president of basketball operations and general manager respectively. Furthermore, it was the season where Jeanie Buss would officially be named the primary owner of the Lakers on March 27. On the anniversary of Kobe Bryant's 81 point game on January 22, 2017, the Lakers lost by 49 points to the Dallas Mavericks 122-73 at the American Airlines Center marking the Los Angeles Lakers' worst loss in franchise history surpassing their record set when the Utah Jazz won by 48 points 123-75 on March 28, 2016. Despite not making it to the playoffs, the Lakers managed to improve on their franchise worst 17-65 record from the year before. Following the season, D'Angelo Russell was traded to the Brooklyn Nets, and Nick Young signed with the Golden State Warriors. In the playoffs, the Clippers are facing the defending 2x NBA champion Golden State Warriors in the First Round, currently trailing the series 1–3, and are on the verge of playoff elimination. The two teams previously met in the 2014 playoffs, in which the Clippers won in seven games. In Game 2 of the First Round, the Clippers set an NBA record for the largest comeback in playoff history, overcoming a 31-point deficit in the third quarter, en route to defeating the Warriors 135–131 to tie the series 1–1. UFC 176: Aldo vs. Mendes II was a planned mixed martial arts event that was scheduled to be held by the Ultimate Fighting Championship on August 2, 2014, at Staples Center in Los Angeles, California. UFC 60: Hughes vs. Gracie was a mixed martial arts event held by the Ultimate Fighting Championship on May 27, 2006. The event took place at the Staples Center, in Los Angeles, California and was broadcast live on pay-per-view in the United States and Canada. WrestleMania 21 was the 21st annual WrestleMania professional wrestling pay-per-view (PPV) event produced by World Wrestling Entertainment (WWE). It took place on April 3, 2005, at Staples Center in Los Angeles, California.The event was a joint-promotion pay-per-view, featuring performers from the Raw and SmackDown! brands. The main match on the Raw brand was Triple H versus Batista for the World Heavyweight Championship, which Batista won by pinfall after executing a Batista Bomb. The predominant match on the SmackDown! brand was John "Bradshaw" Layfield versus John Cena for the WWE Championship, which Cena won by pinfall after performing an FU. Another primary match was an interpromotional match between The Undertaker versus Randy Orton, which Undertaker won by pinfall after performing a Tombstone Piledriver. The featured matches on the undercard were Kurt Angle versus Shawn Michaels and the first ever Money in the Bank ladder match. The event also featured the return of Stone Cold Steve Austin who started his part-time appearances with WWE at this event and Also the final Wrestlemania event that Eddie Guerrero competed in, as he died in November that same year. WrestleMania 21 was the first WrestleMania held at Staples Center, but the fifth to take place in the Los Angeles metropolitan area (2, VII, XII, and 16 - which was promoted as WrestleMania 2000). Tickets sold out in less than one minute for the event, making it the fastest ticket sell-out in the company's history as well as the fastest ticket sell-out at Staples Center. The event drew a Staples Center record attendance of 20,193 people from 14 countries and 48 states and grossed more than $2.1 million in ticket sales, making it the highest grossing WWE event ever at Staples Center. In addition to those in attendance, the event was seen by millions of fans in more than 90 countries.